"If you are holding Leatherwood Rosin in your hand, you are holding a product at the highest end of the sustainability scale." Our deer leather comes from an Australian Venison farm just down the road from the Leatherwood workshop, in Central NSW. This family-run venison producer, the Hansen family, haven been ethically farming Red Deer on rolling pastures for more than 35 years. They have a strong reputation for sustainable farming in our region, caring for both beast and land. While we love our Australian deer leather, we welcome the views of those who don't want to use animal products. As a substitute, we offer a linen rosin bag which protects the rosin just as well. If this is important to you, please request one on the order form in our online store. Australia is home to some beautiful and varied native timbers. During the 19th and early 20th centuries, much of this timber was harvested for building and furniture making. However, Australia now values the protection and regeneration of these forests, and upholds very strict ethical regulations around its forestry practices. States such as Tasmania now grow sustainable plantations for the speciality timbers which we use, and these timbers are available in limited supply for craftsmen to keep these wonderful materials in our realm. In many ways, this is no different to how European violin-making timbers forested and supplied. We source our timbers from these suppliers, and we often ask them to provide off-cuts and unusable pieces that furniture makers cannot use, because our rosin casings are so small. We are very proud of the Australian Pine Resin which is an ingredient in every one of our rosins. 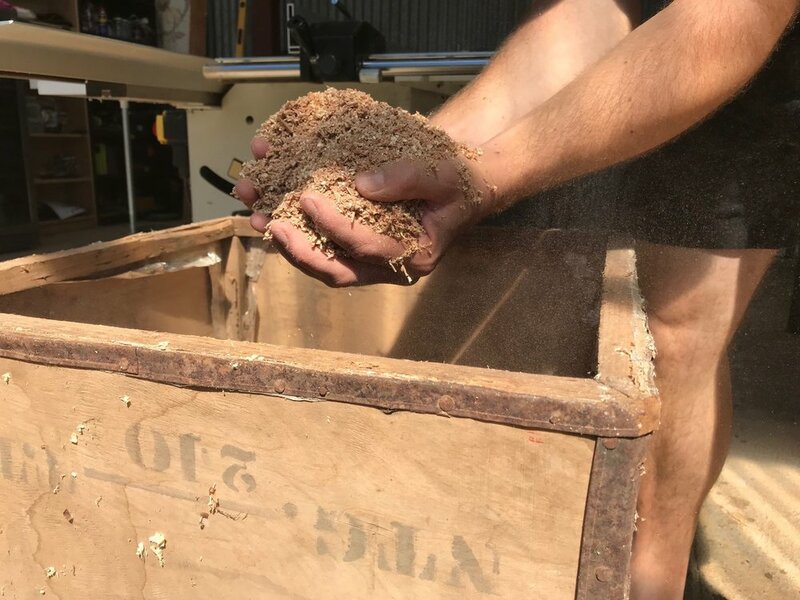 We work closely with Australia's largest pine timber producer and use part of their waste (a type of saw dust) from which we extract and distill our unique resin. Our rosin recipes also include pine resins from other countries, and these are sourced by larger manufactures who implement appropriate and up to date sustainability policies. We are a small family business, and in a given month of production in our workshop, we produce roughly one rubbish bin of waste, about half of which is recyclable. 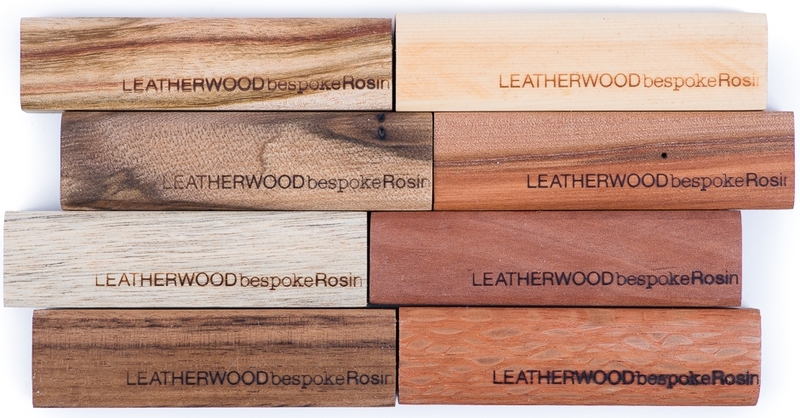 Our leather off-cuts are re-purposed by our retailers to use as shop displays or other uses. The rest is given away to schools for use in art and crafts. Our chickens and horses are the luckiest, as the sawdust from our timber production is used for their nesting boxes and stables. Our timber off-cuts are even used by our children to make swords and other toys! 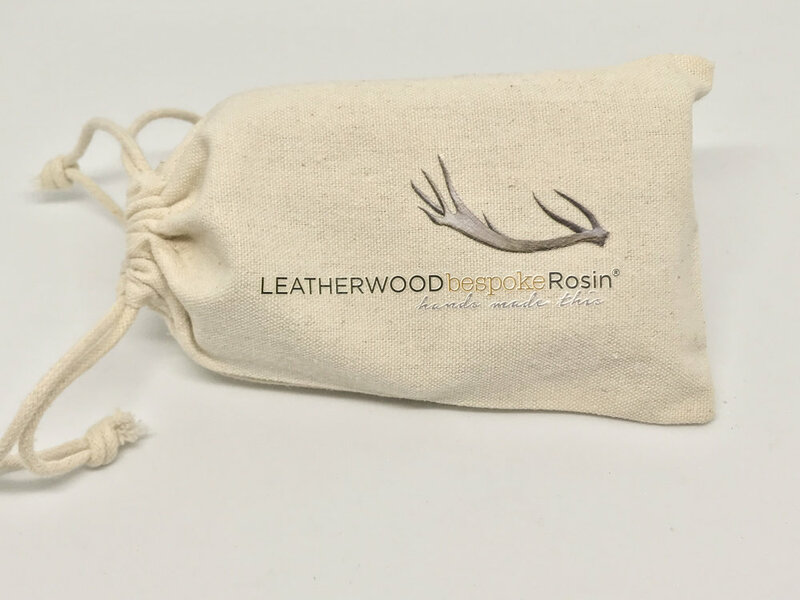 Leatherwood Rosin produces far less waste than a domestic household, and all of our materials are sustainably and ethically sourced. Many other rosins use plastic and nylon (or similar materials) in their production and there is no question that these materials have a far greater environmental impact than our timber and leather.